When it comes to the most popular bathrooms of 2015, there are plenty of trends to talk about. Some old, some new, some borrowed, some navy blue. Obviously, tile played a big role — porcelain that looked like hardwood planks, hexagonal tiles that grew in size, more 3-D patterns than ever, and an old favorite, subway tiles, which showed no sign of going away anytime soon. Materials like teak, brass, reclaimed wood, pebbles, marble, quartz and concrete were big picks as well. Other than that, the most popular bathrooms featured a wide range of styles and sizes. 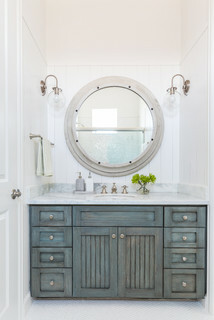 Beach Style Bathroom by Houston Interior Designers & Decorators Laura U, Inc. Chic coastal style. Designers went more subtle when going for coastal style. Rather than creating a shell-a-palooza, elements like distressed paint, driftwood tones and shiplap brought in the beach. In this beach house bathroom, the team at Laura U used an oversized porthole mirror as an intriguing focal point. Free-standing bathtubs. Whether a classic claw-foot or a sculptural contemporary tub like this one, Houzzers loved the way these pieces stand on their own. They also create other design opportunities, such as interesting tub fillers that come up from the floor and the chance to add a stool, side table or bench.